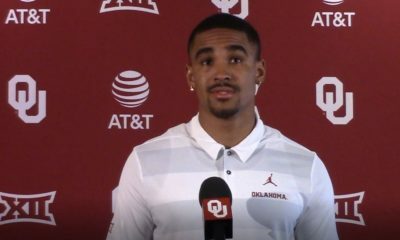 NORMAN — One of the things the Oklahoma defense prides itself on is being multi-faceted, being able to adjust in a week’s time and take on any comers, from air raid to spread option to triple option. But Saturday night at Owen Field, against the discipline and precision of Army West Point, the OU coaching staff devised a plan of absolute simplicity. And that plan almost blew up in the Sooners’ face. 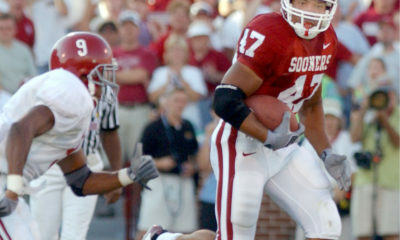 OU won the game 28-21, but was a 29-point favorite. The Sooners improved to 4-0 on the season, but needed overtime to survive and advance. 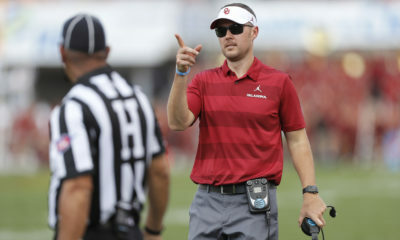 Oklahoma is still on track for a fourth straight Big 12 Conference title and a may be in line to return to the College Football Playoff, but all kinds of red flags went up against Army, and head coach Lincoln Riley said none of them have to do with the game plan that defensive coordinator Mike Stoops devised. “I think the plan was good,” Riley said Monday during his weekly news conference. The plan itself was simple and constant: three down linemen to hold the middle of the field, two outside linebackers to contain the edge, two inside linebackers to chase down Army’s triple-option, two corners to cover any outside receivers and two deep safeties to … well, to make sure nothing bad happened. Except for goal-line situations, Stoops’ defense never varied from that alignment. It was those two safeties, 8-10 yards off the ball on every snap, that could have been deployed differently. The Black Knights snapped the football 87 times, and 87 times, the Sooners had two deep safeties. Knowing Army was going to run the football exclusively, did Riley and/or Stoops consider moving one of those safeties closer to the line of scrimmage, effectively putting eight defenders in the box? The problem, after all, was that Army had too many blockers. That and the Black Knights execute their assignments with surgical efficiency. 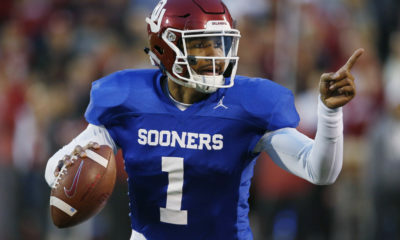 “Well, when you do (move a safety down), then you leave yourself very susceptible to the throw game, and they’re very experienced at what they do,” Riley said. “You see people doing it on tape and really getting hurt with it. So we went in with the game plan that we didn’t want to give up the big play. We felt like that was the right thing to do it. We thought if we kept them from getting the big chunk plays, we would eventually get enough long yardage, and then we would have to be better there. Army came in averaging 23 yards per completion but didn’t get anything over the top. The Sooners were basically playing a bend-don’t-break defense, and the Black Knights bent them all the way to the end zone with drives of 16, 16 and 19 plays. That’s only three possessions, so no big deal right? Giving up 21 points in contemporary football should be applauded, no? Well, not if your offense only gets 40 snaps. Not if your offense is limited to just four possessions in the first half and eight for the game. Army converting 13-of-21 third downs and 4-of-5 fourth downs was downright disconcerting for Sooner Nation. But Riley counters: The Black Knights’ longest run was 23 yards, and their longest pass was 14 yards. What if, instead of 15-play drives, the Sooners were giving up 40-yard plays? “We felt like with, again, such a young defense and so many young guys and just schematically, the challenges they present and the fact you only see ‘em once every two or three years, we felt like instead of having 15 different things, let’s make sure our guys know their assignments. Let’s make sure we don’t give them freebies. And I thought we did a good job of that. “Now, are there times when you come back and say, ‘Sure wish we’d have taken maybe a chance here or there?’ That’s fair to say,” Riley added. “I think you always leave any game as any coach saying that you wish you would have done this or done that better. But the plan we put forth was to get ‘em in as many long-yardage situations as we can and not give up chunk plays. We did a good job of both. 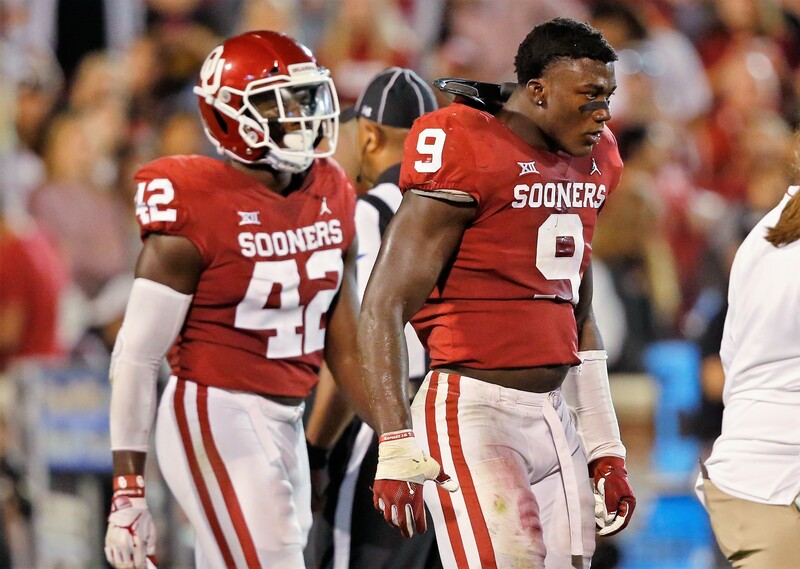 The bottom line: OU players, whether up front or in the secondary, didn’t get off their blocks with any consistency. And presented with an opportunity to tackle a ballcarrier either for a loss or short of the first down, too many Sooners didn’t get the man to the ground. This week, OU hosts Baylor in a Big 12 Conference game. In their second season under coach Matt Rhule, Baylor has been eager to run the football in Rhule’s power scheme. But Rhule joked there will be no triple-option principles installed this week simply because Army ran for 339 yards. Rhule reminded that in his final year at Temple, Army came in as a 16-point underdog and scored a huge upset. The triple-option causes migraines for coaches nationwide. Rhule said he’s not spending much time watching film of the Oklahoma defense’s performance against the Black Knights. Saturday’s game looked an awful lot like the Air Force game in 2010, when the Falcons came into Owen Field running the triple option and rushed for 351 yards and lost only 27-24. Tim Jefferson, the Air Force quarterback, beautifully executed the option offense and rushed for 107 yards, and three other AFA runners scored touchdowns. The Falcons had the ball for more than 35 minutes and had almost 100 more total yards than OU did. And there wasn’t much the Sooners could do to stop it. Schematically, OU probably simplified things too much. Army came to realize Stoops was not going to deviate from his plan, so there were no adjustments to make. Army just kept doing what it does so well, and in the second half, they generated drives of 19 and 17 plays. On the 19-play drive in the third quarter, Army quarterback Kelvin Hopkins executed an option keeper to the outside on fourth-and-1. He made it easily, a gain of 5 yards, and when he was finally stopped, both safeties had rushed over and were standing over him. Had Kahlil Haughton or Brendan Radley-Hiles been placed nearer the line of scrimmage, that player might have been able to hit Hopkins for no gain or even a loss. 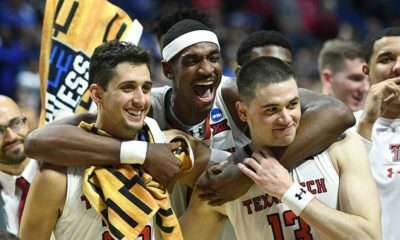 Those four long drives together consumed nearly 40 minutes off the game clock. Couldn’t the Sooners have stacked the box a time or two here or there, or attempted a run blitz, or ran some twists or stunts up front? Something to change it up and get the opponent out of its comfort zone? Army was able to keep its offense on schedule because, going into the fourth quarter, the Sooners had just two tackles for loss. Riley said it was a hard choice to try to take risks against that offense. Keeping Haughton and Radley-Hiles off the ball did actually pay dividends. When Army finally did try to surprise the Sooners with a deep throw on a first-down play late in the second quarter, Hopkins’ pass was well-defended by Haughton and fell incomplete. “I think it comes down to the experience of your players and then comes down to a scheme you just don’t see that often, and then what’s gonna be your plan going into it?” Riley said. “I think the plan was good. Like I said, if we convert one more of those third- or fourth-downs defensively — and long — then it’s a different game.